If your hands are closed for giving, you wouldn’t be able to receive either. I’m a firm believer that whatever we put out into the world, whether good or bad, comes back to us tenfold. It doesn’t necessarily have to come from the same person, but by the law of karma, it will come back to us. However that doesn’t mean we should give to receive, I make sure that I come from a place of service. We give not to receive, but to give. It’s a way of life. That’s also from one of my ULTIMATE favorite books, the Go-Giver. That book has revolutionized the way I see not only business, but my life in general. I volunteer in different non-profits, organizations, and still “work-for-free” here and there and today I want to talk about it!! Volunteering doesnt have to be a big thing where you volunteer to teach kids in another country or go to very rural area for a medical mission. When you share yourself, your time and more importantly your heart, you’ve done more than enough. For as long as I can remember, I wanted to be a barista. 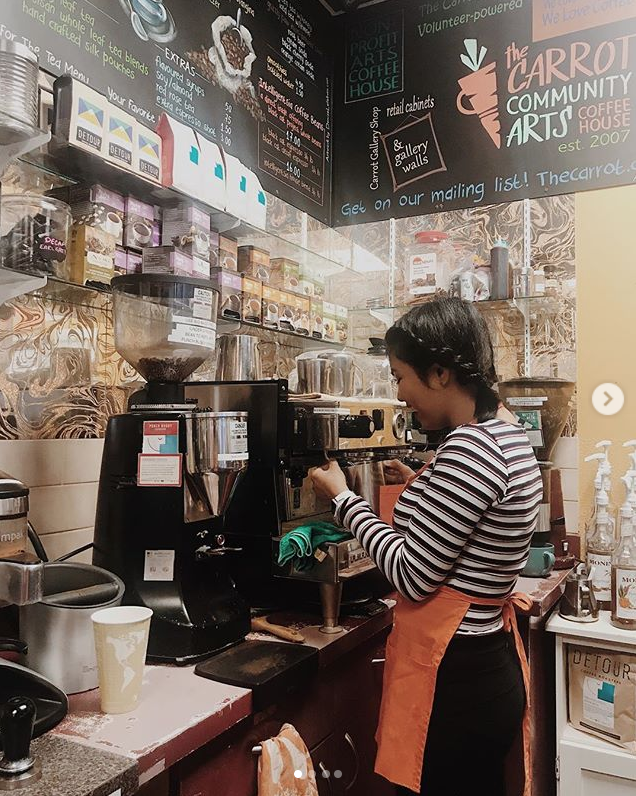 As some of you may know, I run as semi-lowkey Instagram account where I share the coffeeshops around Edmonton, Calgary and Toronto that I get to explore. I don’t necessarily like to drink coffee, but I just adore being in coffeeshops! When I found that The Carrot was a volunteer-powered, it didn’t take me 10 minutes before I filled out their forms. And on my first day, boy was this girl happy!! I was literally squealing the whole time I steamed milk for the first time and making espresso? I was an expert. The sound, the scent, my co-volunteers cheering me on, it all fascinated me! I was more than excited to send a picture of me making my first barista coffee to my mom. It literally felt like I was given a gift more than me volunteering my time. Haha! It’s like I’m in those gradeschool field trips, ya know? Don’t even get started with me about getting to be the “cashier.” ULTIMATE CHILDHOOD DREAMS. I didn’t realise how big of a blessing volunteering in that coffeeshop would be. I also met one of my favorite friends, Ariel, there. We talked briefly and when we found our similar nerdy tendencies, we’ve been close friends since! In fact, I call him my “bestie” just to tease and he gets super annoyed because I “have to earn it” hahaha! But our friendship is something that I really hold close to my heart. 2. You get to be surrounded by other givers. The other night, I was at a local bar downtown celebrating Inspire Her Society’s first year!! They are a non-profit organization supporting and creating a community for working women. I love my InspireHer family so much. I learn a lot during our mastermind sessions, board meetings and just from the people that they are in general. We are a team of 11 women and we’re pretty diverse which is to me, very empowering! They always make sure to make you feel heard and appreciated. They also give the kindest feedback and warmest hugs. Like my time with the carrot, this one feels more like a blessing than an obligation because being with the girls, I get a different sense of sisterhood filled with love and support for one another as we work towards the same cause. It’s also very inspiring to see them work their butts off and make sure everything is done 10x. Sometimes I forget we’re all doing it “for free.” Isn’t it such a beautiful thing to be part of something that attracts people who are givers too? It just shows their values because they don’t necessarily get something direct from it and they give more than they take most of the time. 3. It trains your mindset. You do something not for what you’re gonna get from it but because you genuinely want to give them your time and put your energy towards something you believe in and want to be part of. There are tons you can get but your focus is on what you can give. I remember doing the closing shift one time at the coffeeshop I told you about on number 1. I couldn’t remember the last time I held a mop before then! Haha! It was a different kind of experience. My thoughts led me to “I get to do this..” I realised how there are probably millions of people mopping the floor, sweeping, wiping the tables just like I was doing. Except they have to do it because it’s their job and they are required to. On the other hand I was there, doing things because I want to. I get to do things out of choice and it was so liberating. I was super grateful, being reminded of when I was also in that position and how life turned out so differently. That single moment made a shift in me and I was doing it like I was a Disney princess singing while cleaning. Haha! I promise I would always go back to my roots and remember where God delivered me from. 4. Your greatest opportunities may just come from it. You never know. In facebook groups, twitter, instagram and every now and then, there’s a post or two about scoffing working for free. I mean, I get it, exposure wouldn’t pay the bills. And maybe I’m lucky because I don’t have the responsibility of feeding a family of 4 or paying for mortgage so I wouldn’t understand. But I think when you look at it that way, you’re only thinking about short term. Because the opportunities, the relationships, the platform, the biggest clients that I have now, they all came because I worked for free at some point. Another example, and someone who preaches working for free as well, is Gary Vaynerchuk’s DRock. (I don’t feel right calling him his videographer, because he’s something more than that and he does so much for Gary’s brand. He literally is his own job description haha!) He got his opportunity to work for Gary by asking him if he could work for him for FREE. And where is he now? Well, everywhere Gary is! That’s the same scenario for Gary’s brand manager Andy Krainak. I love Team Gary Vee, can’t you tell? Haha! These big examples of giving and being open to work for free (with set limitations and playing it smartly) are the reason why I always cringe whenever people make fun of the topic. But I don’t know. I have no idea what their experiences have been. But as for me (and all my mentors), giving is the secret to living.